Give us your Ruger story - win a shirt! Re: Give us your Ruger story - win a shirt! Son, you get anywhere near my belly and I sure fill out all the blank spots in that collection of bullet holes you been puttin' together. Yer welcome. Wish I had more to not accept. A fella could get famous not acceptin' stuff. How about if I drop out of the Democratic race for president? Naw! Everybody else has done that already. Was gonna save this one for next week, but just can't resist. My favorite part of this thread is the first picture on the first page . Not to offend the Marshall (it's rather a compliment) but I ain't believin any stories about 6 year old grankids or 30 sumthin sons. "Every man steps in the manure now an again, trick is not ta stick yer foot in yer mouth afterward"
religio SENIOR est exordium of scientia : tamen fossor contemno sapientia quod instruction. Great story Chuck. My wife's been lookin around awhile for just the right gun. I mentioned .32's to her in the past but she's been more interested in .38's lately after accidentaly shootin .357's through mine and realizin she could handle it. She's a small gal, and I still think a .32 would give her the bang she likes but with better accuracy (less kick). Any further opinion on these pistols, that you obviously love, would be great. Leo You need to get her to a shoot and ask some pard to let her shoot a set. Elsie my BETTER half has Aurthor real bad and these were perect for her. Elsie has the birdsheads. I'm loading her a mild load with 110 bullets. Recoil isn't a problem and at our distances there very accurate. Shes even let me shoot them let me see if I can remember OH yes maybe a couple times. And by the prices I see the used ones selling for you won't loose any money in the future. I did buy her a set if gunfighter grips so they are quit thin and a very easy grip to hang on to. I would certainly recomend them for a lady with small hands. Thanks Chuck, she loves the birdshead frames. I'll get her hands on one for a trial run, but the gut tells me we have a winner here. She has some health issues as well (enough to keep her away from the .30-30) so for the long term, it seems like the perfect caliber. I have kinda small hands, and I like the Birdhead grip, too. When I bought my last Vaquero, it was still back when they were all the bigger versions. Mine was a special run from the factory (of 5000 if I recall) that was a kind of test version with a 3 3/4" (3.75") short barrel that had the standard grip - they called it a Sheriff's Model. 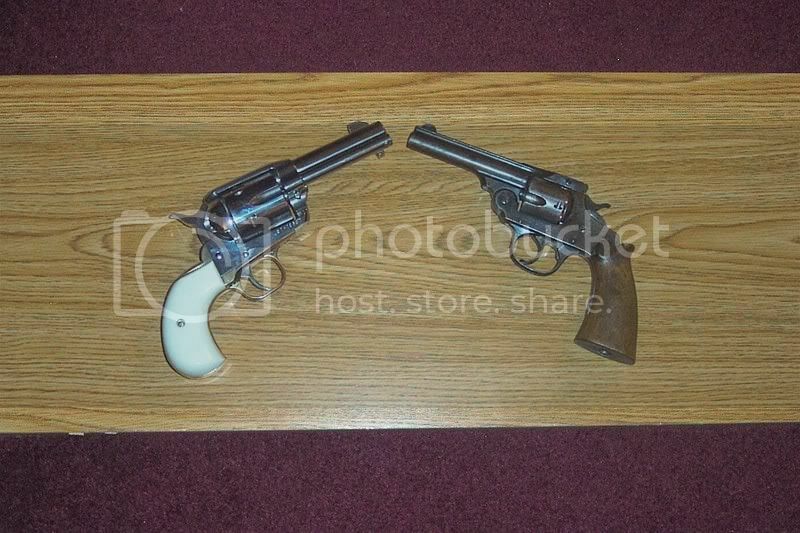 The gun is polished Stainless, 45 Colt and the white factory grip had no Ruger Medallion, rather the Ruger symbol was "scrimshawed" (laser etched) on it and pretty large. VERY handsome. At this time, there were NO Birdhead Vaqueros released - perhaps rumored, but not yet released. Anyhoo, I found a company called Qualite' that had a DIY (do-it-yerself) brass B-head grip conversion, made of brass. I chose brass over the stainless they offered and with a set of white Hogue grips. Lemme tell you - that gun - when polished up and gleaming, is REAL purdy! (IMHO, of course. ) This grip has a slightly different contour than what Ruger eventually released, about 1-2 years later. "May Your Powder always be Dry and Black; Your Smoke always White; and Your Flames Always Light the Way to Eternal Shooting Fulfillment !" Take me out to the black, tell 'em I aint comin' back. Burn the land; boil the sea: you can't take the sky from me. Have no place I must be; since I found Serenity: you can't take the sky from me. Steel Horse those are some nice looking shooters. The birdsheads are definitly a if it feels good thing. You see alot of folks wanting slimer or birdsheads grips. For me I like the standard size. For the wife birdsheads are the pick. I guess its something we figure out as we go down the trail. What fun Hay!!! Nice hardware! Thanks for the pics and info. I prefer the big OMV grips, but I seem to be a minority in the shooting world. Marshal'ette, I received my shirt today. Thank you to you, your grandaughter and Ruger. It looks great. Formal wear for me actually. Sort of a redneck tux if you will. I love it. bumpity bump. I can almost catch a whiff of that "new shirt smell". So Leo.. you will get to "whiff" the new shirt all you want as soon as you send me your real name and address and shirt size..
Then I'll do the rest. The smell of heaven is Fresh Baked Bread and Gun Powder. It is with deep gratitude that I accept this prize I will get the personal info to you post haste! I love my shirt Marshalette. I wore it to a formal affair. A sort of rally of tree huggin' PETA folks. I got lots of comments on the shirt. I'm proud of ya! Savin' rain forests and American woodlands and swamps and critters are (is) important. But NOT at the expense of common sense! The PETA folks need to learn how the food chain really works ... as God intended. (NOT that I have an exclusive line on what the Big Guy means, don't ya know. ) They seem to forget that people are actually part of nature and that we're omnivores, NOT strictly herbivores, like some of God's critters! I just got home from a long day on a job site an guess what was waitin for me on the door step? The quality of this shirt is incredible, but what else could we expect from anything with the Ruger monicker on it! As stated by one of the other lucky winners it is dang near a jacket. The recoil pad on the right shoulder is a very nice touch. Thanks for the rush mail service, it really made my day. Glad you like it.. They are great shirts. Unfortunately I am now down to just the Large and Medium sizes... so some of you fellers might want to enter for your wives. I wear the medium and it looks mighty purty on us gals. Guess I'm just lucky to have avoided those X's all these years. People by me XL shirts as gifts and it's all I can do not to say, "thanks for the nightshirt". OK, M'ette, my wife is too busy showing dogs to shoot, but I'll enter my Grandson "Darn Near" for one of those shirts. He does like my Rugers better than the .22s he just graduated from last year. Now I have to reload twice as much. My daughter, Litlle Miss, is now hooked on centerfire as well. She looks at the old .22 like it's a BB gun-wants nothin to do with it anymore. I'm proud but I sure miss those cheap 525 round boxes! I'll bite. My son would love a shirt. He is currently shooting a red pad M77 in .243 and took his first deer this last October. "I DROPPED him!" is still echoing through the mountains. I have an OA stainless & NRV 5.5" blue that I love. I imagine that was a prouder moment for you than him no matter how happy he was! Bein a Dad can be a sheer joy. Nice buck! Now mind you, I have a gun safe with multiple "other" Ruger items. Went to a gun show here in East Texas..Started looking at the pistolas. I bet I passed up a dozen Rugers cause I was lookin for that click,click,click,click that pertains to other shootin irons. Now remember I'm no stranger to Rugers....I took the AWA out to shoot and within minutes of firing shots out of it, I knew instantly that I had picked up the wrong gun...kinda like pickin the wrong woman...but that's another story..
now I'm sporting (in place of courting) twin sisters..and boy are they sweet..
Now there is one part of this story, that I haven't told...The AWA was bought for me, by my wife as birthday present. so Marshall'ette..if'n there's a shirt somewhere there available, I'll be asking you to send one not to me, but to my loving and most graciously understanding wife...she deserves it. If you get to thinking your important..try ordering someone elses dog around!